One of the things I'm asked about all the time is where to shop for denim. Great jeans are one of the foundations of your wardrobe but it can be tricky to find the right combination of shape, fabric and most important of all - stay-usability! So first things first, I don't think you have to pay to get good jeans. I think there are some amazing brands that cost more than £100. There's no doubt that they fit well and look great but with a bit of patience and lots of trying on, I believe you can find a good high street pair that will do the job just as well. Based on the many many pairs I've owned over the years, here are my 5 recommendations of high street stores to buy denim and all the recommendations are less than £50. I feel like lots of what is for sale in Topshop is increasingly out of my league but their denim always delivers. I have both Jamie's and Joni's in my wardrobe and they still rate as the best skinnies all-round. I recommend Joni's if you're looking a pair of super high waisted black or black coated jeans and Jamies are my pick for blue denim. Not quite as high waisted as the Joni's but a little less clingy so perfect for comfortable day to day wear. These look most like the Jamies I have. I like how Topshop bring out new versions & colours every season and if you know your size, you can order away at the new ones knowing they will fit. I wear a 28 x 30 in all my Topshop jeans. and here's my Joni black ones - again I wear a 28 x 30 and if you ever see the coated ones, buy them as they sell out online and in store constantly. They're that good! There's a great Find your Fit guide online on this link to help you work out the differences between their different types. Getting off the topic of jeans I've actually tried myself, I'm looking forward to trying on these Straight Cropped ones next time I'm in town. Stradivarius is here because they're a bit more fashion forward but less expensive than Topshop. It means that you can try perhaps an embellished or a distressed pair or even a style you don't usually wear, to add a bit of interest to your jeans collection, without breaking the bank or being too bothered if you only wear them occasionally. 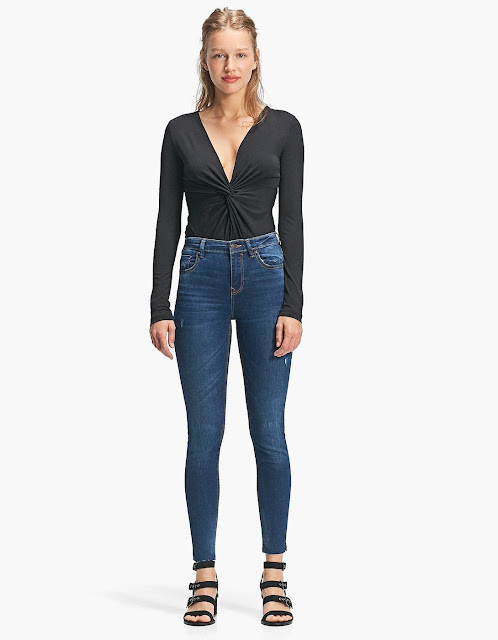 I recently discovered Stradivarius high waisted skinny jeans with just the right amount of distressing and a lovely split unfinished hem detail and they're now a firm favourite - for less than £20! 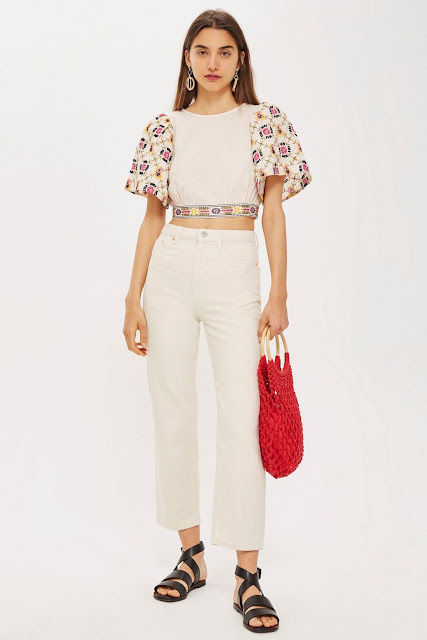 In fact, they've currently bumped my Topshop Jamie's off top spot as the hem detail is great with sandals and shoes where you want to show some ankle but don't want turn-ups. I notice there's a Super High Waisted version too which I've not tried. I find the high more than adequate on my long body. I bought a 12 in mine and they fit me perfectly. Best of the supermarket brands here, I recommend Tesco for skinny jeans - make sure you hunt out the Premium or the Contour range. The denim is a fabulous quality and for the price, they're amazing - really hold their shape and stay up on the bum well. These are my current favourites but the contour high rise is a style they have year-round. It's disappointing to see that Tesco is stopping their online clothing from the 9th July with everything going back in store. Such a backward step as I'm sure I'm not alone in wanting to stay away from the supermarket. I rely very much on click & collect or home delivery for my groceries and I'll miss not being able to order the clothing online too. 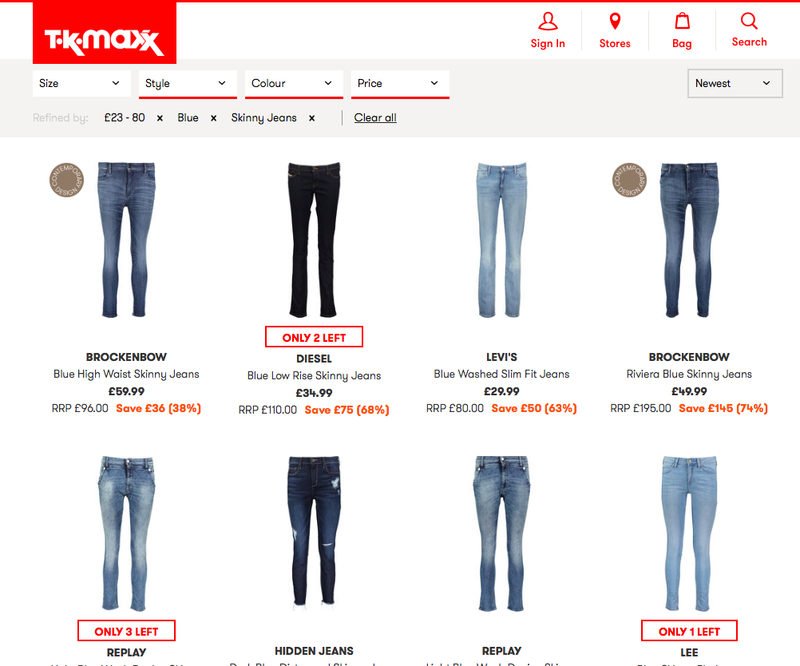 However, when the Clothing at Tesco range expanded to include other clothing brands and the website become practically un-searchable due to the sheer volume of product, you could tell they were losing their way. Why can't these companies keep things simple? It's the same gripe I have with Next. I don't want to buy Coast or Oasis via the Next website. I feel it really dilutes the brand identity. Anyway...rant over. Get your Tesco jeans online while you still can! Next up, my newest find - the Monument Skinny at Label Lab in House of Fraser. I was properly blown away when I tried them on at my HOF styling session this week. Beautiful fit, gorgeous soft denim and the ones I got have the loveliest light distressed wash and a let down frayed hem detail. Just the right amount of distressing for me - keeping the look on trend but not getting too tragic. I got the size 30 - they're about a 10-12. Fit me perfectly. If there had been a 29. I would have tried it. The 28 would have been too small. I've not tried the rest of the range but do check them out if you're in-store. And finishing with a bit of a random 5th option because I can't speak specifically about a brand or a particular pair from here but I have had so much success buying denim in TK. In fact, I was in yesterday and there were amazing Replay jeans down to £24.99 from over £100. There are also brands that you might not have heard of before but that fit like a dream. I still wear a pair of Kings of Indigo jeans I got there a few years ago. A very cool Dutch denim brand that make sustainable jeans that retail in or around €100. I got a pair for about £30. The hoking is not for everyone I know but if you want to find gold, you gotta hunt! I hope I've given you some denim inspiration here - definitely lots of high street options worth looking into. Do share any more you love. I have friends who swear by River Island Molly's for instance so please let me know where I need to go try next! Hope you have a fab weekend my friends...if you don't hear from me, it's because I'm partying./trying to forget. Birthday time again 🙈...eek.. I am still wearing my boot cut jeans from the 1990's and can honestly say still wearing clothes 20yrs plus. Where do all these bloggers get their disposable income from? I would just love even a tiny of fraction of what they spend a month to last me a year. I can only dream on.